Technology and innovation is serious business in Japan, they have a myriad of research institutions and most of their universities actual “institutions of higher education and research.” However to an individual without an open mind many things coming from Japan would seem rather “different” for lack of a better world but even for an open-minded geek like me news of a human-shaped mobile phone is still rather weird. 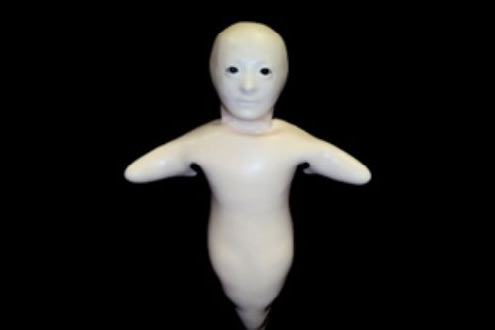 Developed by Osaka University, Advanced Telecommunications Research Institute International, the mobile telephone operator NTT DoCoMo and other institutes the human-shaped mobile phone with an outer layer that feels like human skin which enables users to “feel closer to those on the other end.” A speaker is installed in the head of the doll-like gadget and a light-emitting diode in its chest turns blue when the phone is in use and red when it is in standby mode. The body resembles a human being but its design is so blurred that it could be taken as either male or female and young or old. “Is your cellphone faceless? Feels like plastic? and doesn’t creep you out? Well what are you waiting for? 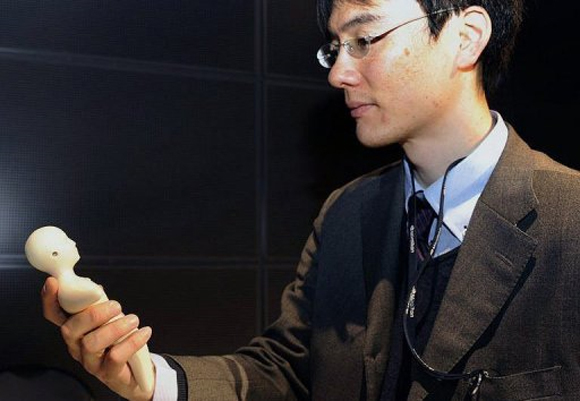 Call 1-800-human-phone to get your very own cell phone from Japan with a human look and touch! Especially useful for long distance relationships.” *friends to call not included. Chobits – slowly but surely becoming a reality.